Faith and Trust. These are two different things. 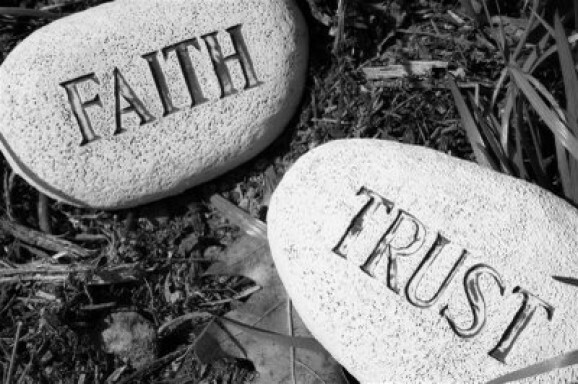 Faith and trust are indeed contradictory. Trust is earned, faith is blind. Faith requires no evidence for belief or practice. The very nature of faith surmises that tangible evidence doesn’t exist. Otherwise, there is manifestation. Trust is based largely on evidence that is real. In order to trust, there are usually some verifiable facts. Trust is the core conviction of judgment based on knowledge, instinct, and experience. Or is it? The emphasis is mine about the loan, the friend and to thine own self be true. I guess there are too many lies I’ve told myself. Although at one time I used to be very religious, I am no longer a religious person. I don’t have a great deal of trust for religion. On the other hand I have come to acquire a mountain of faith. But I have lost a good deal of trust. Like Polonius and his announcement about lending money, I know trust can be lost. Contrarily, at one time I used to be a very scientific person. I studied biology, math, chemistry and engineering. I am no longer a scientific, secular humanist. Though I do trust science, many scientific ‘facts’ and ‘theories’ change over time. So I have lost ‘faith’ in science. There are those who have complete ‘faith’ in the ‘theory’ of evolution, Darwin’s ‘On the Origin of the Species’ is a remarkable theory. But it has never been proven. Though there is some limited fossil evidence, no one has ever seen a species bifurcate and evolve into a new species. Mainly because such an event would take a long, long, LONG time. Hundreds to thousands of generations are required for ‘selection’ to work it’s magic, especially for something as complex as a mammal. Though there are anecdotal examples of selection at work, no one has ever proven a new species has evolved from an old one. Not even with Genetically Modified Organisms. Besides the fact that playing with genetics is fun and interesting, a Chihuahua can be mated with a Wolf, and the offspring will be able to reproduce. Typically, the definition of a species has something to do with viable offspring. These two books—Michael Denton’s Evolution: A Theory in Crisis and Michael J. Behe’s Darwin’s Black Box —describe this phenomenon. The first surprising thing Denton points out is that there has always been a dissident faction of highly distinguished scientists, of impeccable credentials and no religious motivations, who have declined to concede that evolution has been proved. This is inconvenient for evolutionists who would like to dismiss their opponents as Bible-thumping hicks and claim that questioning evolution is tantamount to questioning the value or validity of science. He also points out biologists like Richard Owen, who were prepared to allow that evolution had taken place but thought that other causes were involved in bringing about the origin of species. Wyatt: What does he need? There’s only one thing that can fill that hole; and it’s a hole every one of us has. It’s a battle between good and evil, a battle between faith and trust. Without faith, I am nothing. How can I find my way back home? This entry was posted in Addiction, Alcoholism, Blog, Change, Drunkalog, Faith and Trust, Mysteries. Bookmark the permalink.